← You pick the (sweet) food. I report on it. 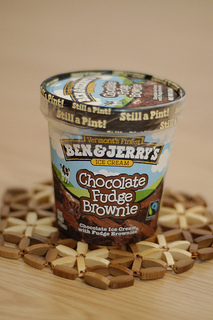 In my college days, Ben & Jerry’s Chocolate Fudge Brownie was my go-to ice cream when I had a rough week or had accomplished something noteworthy and deserved a reward. Though I would never attempt this at my age, in those days I would just sit down and polish off an entire carton in a matter of minutes. I generally try to gravitate towards less sweet products, but there was a half price sale at Publix so I had an excuse to pick up a pint of this. In spite of my nostalgic attachment to this product, I’ll do my best for an unbiased review. This ice cream is about as sweet, rich, and decadent as you can get. As you come across the brownie pieces, your teeth sink into spongy cake with an even deeper sweetness (if that is even possible). When I eat this my “avoid too much sugar” angel on my shoulder has to keep quiet or else I can’t enjoy myself. I love how the base ice cream itself is so thick and gooey. It would work fine on its own even without the brownie bites inserted. This ice cream also tastes colder on the tongue than most others I have tasted, possibly because it is so dense an can hold a low temperature better than others. One reason for this is a high concentration of water. A 105 g serving (1/4 of the container) contains 270 calories, which is significantly above average for the ice creams I typically enjoy. I’ll just let the cat out of the bag – Chocolate Fudge ice cream contains way more sugar than anyone health-conscious would ever consider consuming, a whopping 28 grams per serving. But the fact this ice cream is so bad for you is what makes it so tasty, and why it’s perfect for special occasions when you feel you deserve it. Just make sure you eat no more than half of the carton at a time! Other nutrients are mediocre, with 5 grams protein, 2 grams fiber, 15% DV of iron and 10 %DV of calcium. There are around 20 ingredients, which is no surprise because typically brownies require several ingredients on their own. Also, this product isn’t marketed as a healthy ice cream so there’s no reason for the producer to try and reduce the ingredient count. Ingredients of note are liquid sugar (#2), water (#4), and cocoa (#6). There is also three egg ingredients (egg yolks, whole eggs, and egg whites) present. While Ben & Jerry didn’t go out of their way to use ingredients thought to be ‘healthier’ such as agave syrup instead of plain sugar, its nice to see there are no artificial flavorings or colorings. There is no ‘natural flavor’ either. One minor annoyance I have with this product is the ingredients for the base ice cream and brownie bites are not separated as is done for other products. I have a feeling the thick texture of the ice cream base is due in part to egg yolks, but I can’t tell for sure since eggs are also typically used in brownie baking. The brownie bytes make this ice cream very filling so it can be enjoyed even when you’re hungry. Regardless of the state of your stomach, you’ll get a huge sugar rush after this. This is available in many different grocery stores, from Publix to Target to Walmart, for roughly $3.79 for a one pint container. This ice cream is perfect for when you want to go overboard and just totally enjoy yourself – at the cost of a massive amount of sugar intake. Not recommend for frequent consumption. Posted on October 4, 2013, in Food and tagged Ben, Ben & Jerry's, calories, chocolate, Chocolate Fudge, decadent, deep, eggs, fudge, Ice cream, Jerry, protein, rich, sugar, sweet. Bookmark the permalink. Leave a comment.